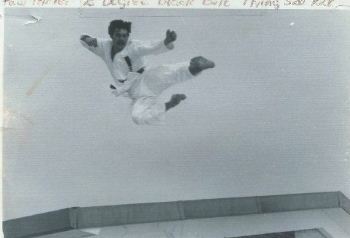 In March 1971 I had just tested and received my first degree blackbelt at the Sheboygan Tae Kwon Do Karate Academy. This photo was taken at the south end of Muehlmeier Dorm. Here you see me running off the two story roof and executing a jumping left flying sidekick. There was a six-foot snow drift that ran along the west side of the dorm north to south that I landed on. This picture was the best of three tries. Ron Hartman photographed the event. Also present were Don Cera and Mike Okray. I kept the photo in my 6th-grade classroom during my thirty years of teaching. It was always a topic of conversation.